It’s winters like these that I’m not so fond of living in Canada anymore. 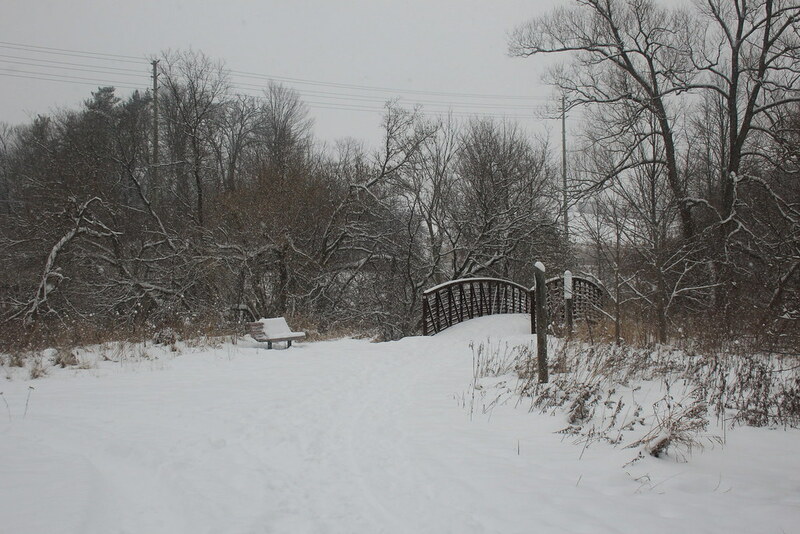 We headed out to the William Granger Greenway, along the Humber River Trail, this morning between last night’s snowfall and this evening’s. Except it didn’t stop snowing all day. 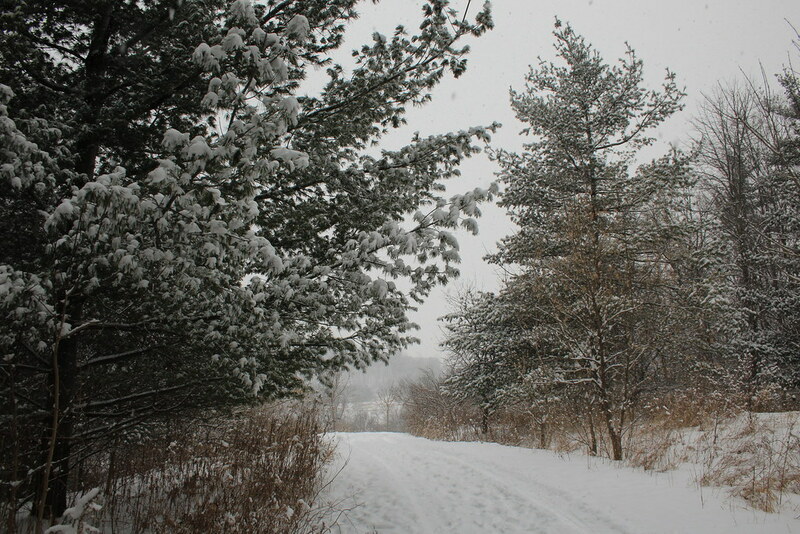 In fact, it snowed even more as we made our way along the trail. 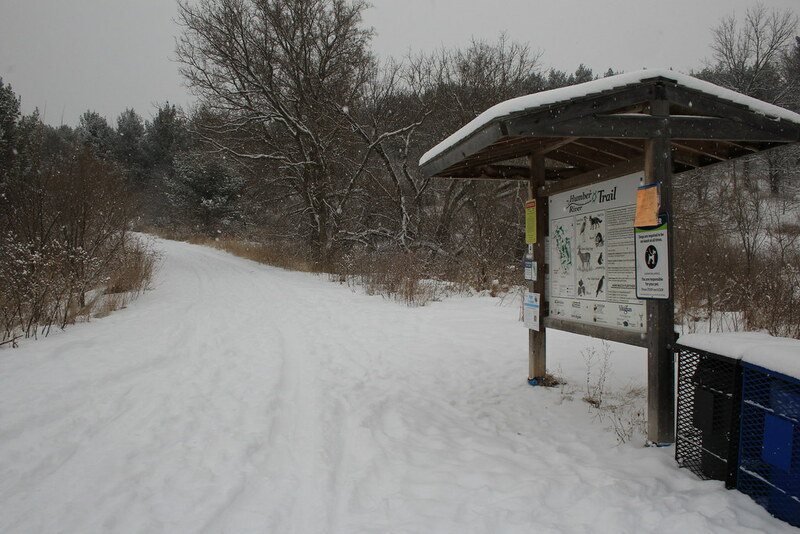 We parked at Rutherford Road, just north of Boyd Conservation Area (I have this slotted for another trip). 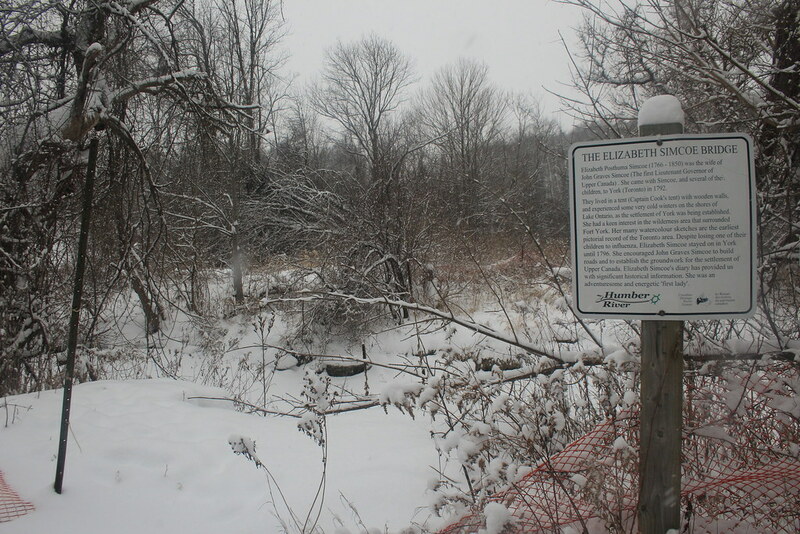 The William Granger Greenway follows the Humber River on the west side up through the Kortright Centre for Conservation. This section of the trail was pretty quiet. Still, there was a lone hiker that had started out just before us. The boot prints were only just beginning to be covered in the still-falling snow. The trail starts uphill for a time, then a winding downhill through what would probably be an open field. But since everything was covered in snow, it was a giant white expanse of blinding – even without direct sunlight! But don’t the trees look so pretty covered in fresh snow.. 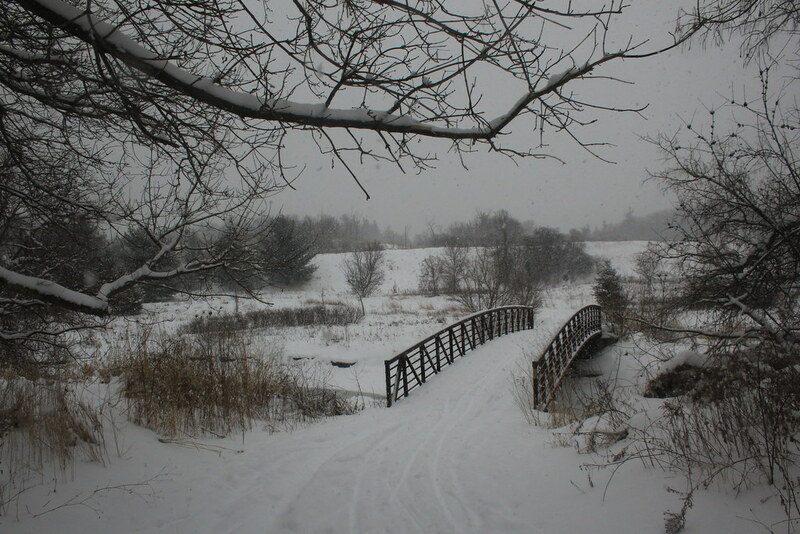 There are a few bridges along the trail. Thankfully well-maintained so there was no question about crossing over them in these conditions. They are all dedicated to the historical figures that have used the Humber River Trail to help build and shape this area. 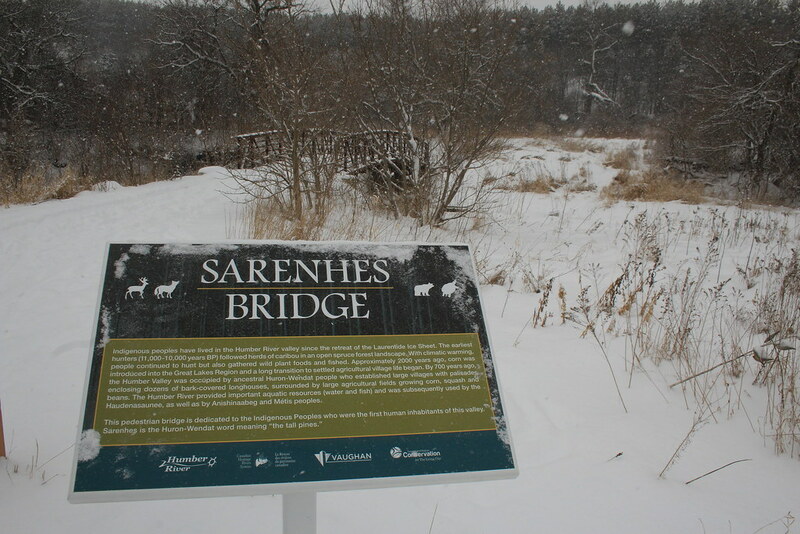 The first one we crossed was the Sarenhes, meaning “the tall pines”, dedicated to the Indigenous Peoples. 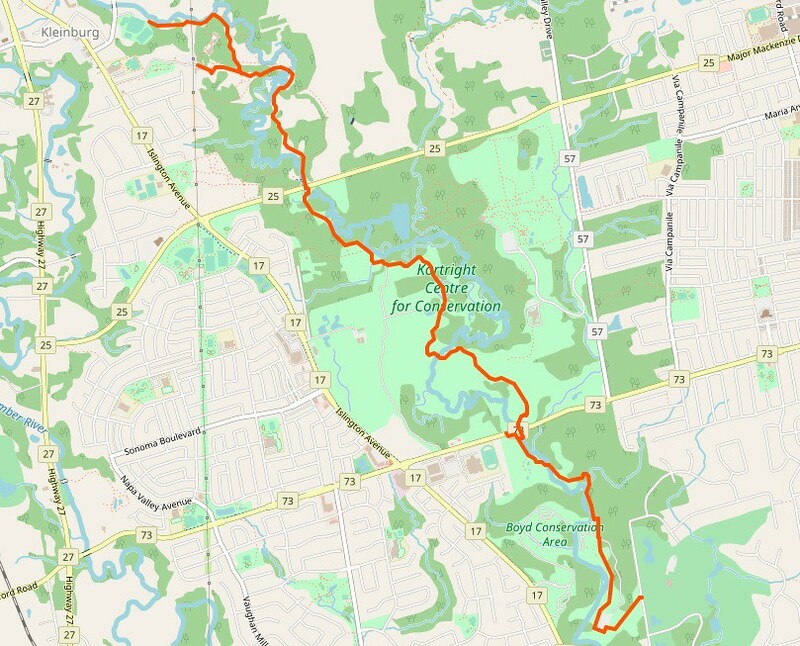 Though the trail bordered with trees there isn’t really any part of it where you are covered by them, save this one 30m stretch. It doesn’t keep the snow out or anything, but it does shelter you from the wind ever-so-slightly. The next bright comes just south of Major Mackenzie and is dedicated to John Graves Simcoe, who was the first Lieutenant Governor of Upper Canada. There is another access point here from the road, but the parking is in nearby Foster Woods (which also has its own network of trails, and is also on the list for a future trip). Across the bridge is an underpass, so you don’t have to risk your life trying to negotiate traffic across Major Mackenzie. 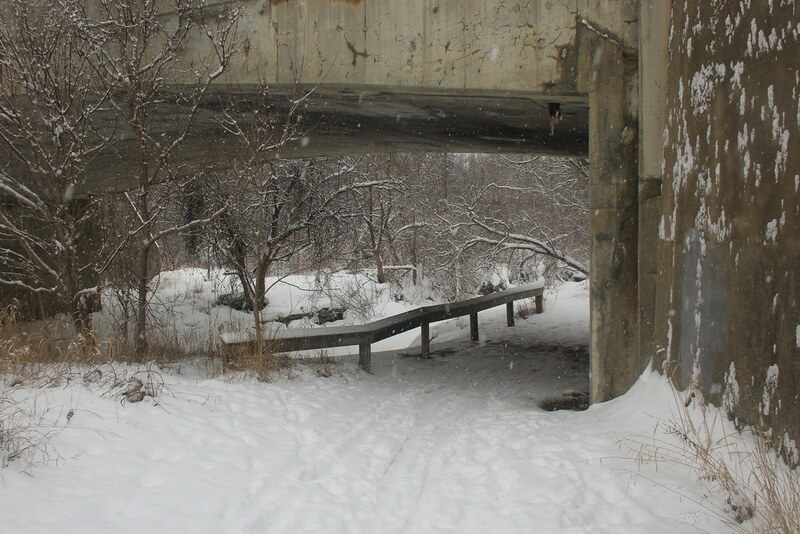 We referred to this as the ‘mini murder pass’, in recognition of the underpass of the 401 along the Humber River Trail in Rexdale. Elizabeth Simcoe was John Graves Simcoe’s wife, and a watercolour artist. The bridge dedicated to her appears to be missing, and I assume this is the actual link to Foster Woods. Thankfully this was not our route today along the William Granger Greenway. 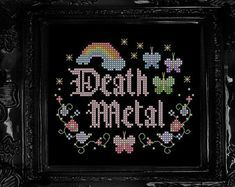 I hope it gets replaced sometime before our next adventures in the area. 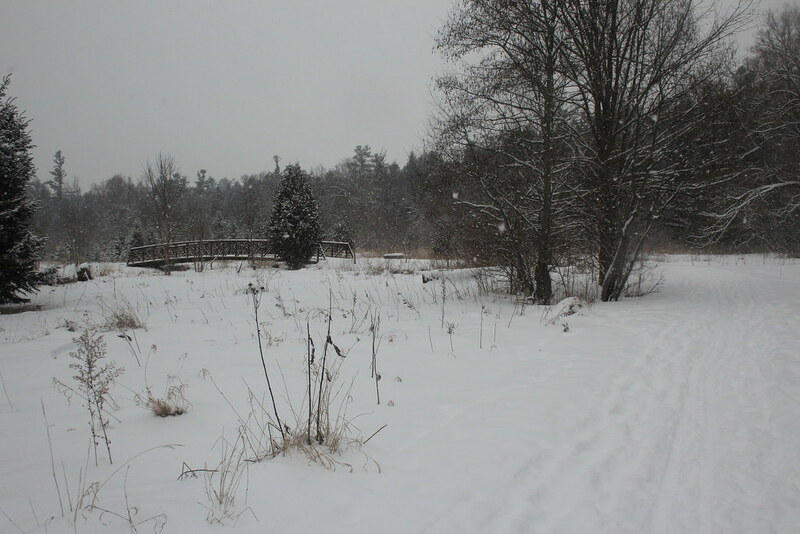 After another pass through a blinding, snow covered field you’ll find yourself approaching the McMichael bridge. 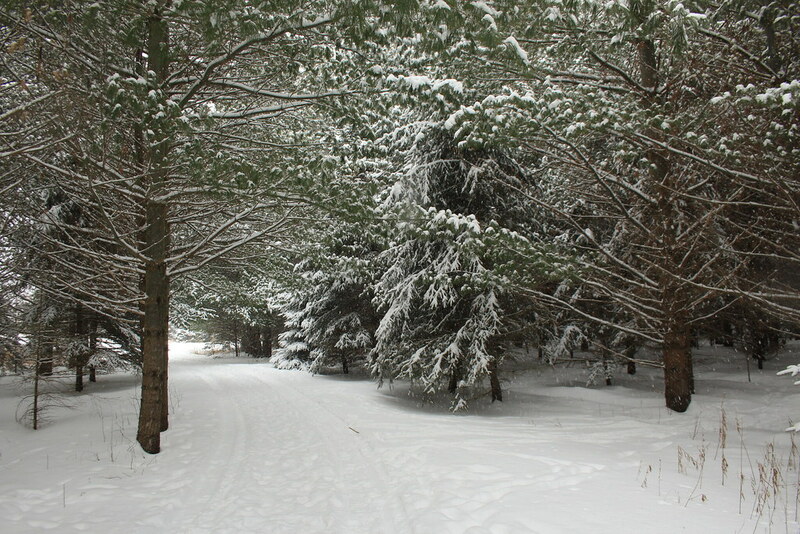 This leads in to the McMichael Canadian Art Collection’s property, which is a destination of its own. 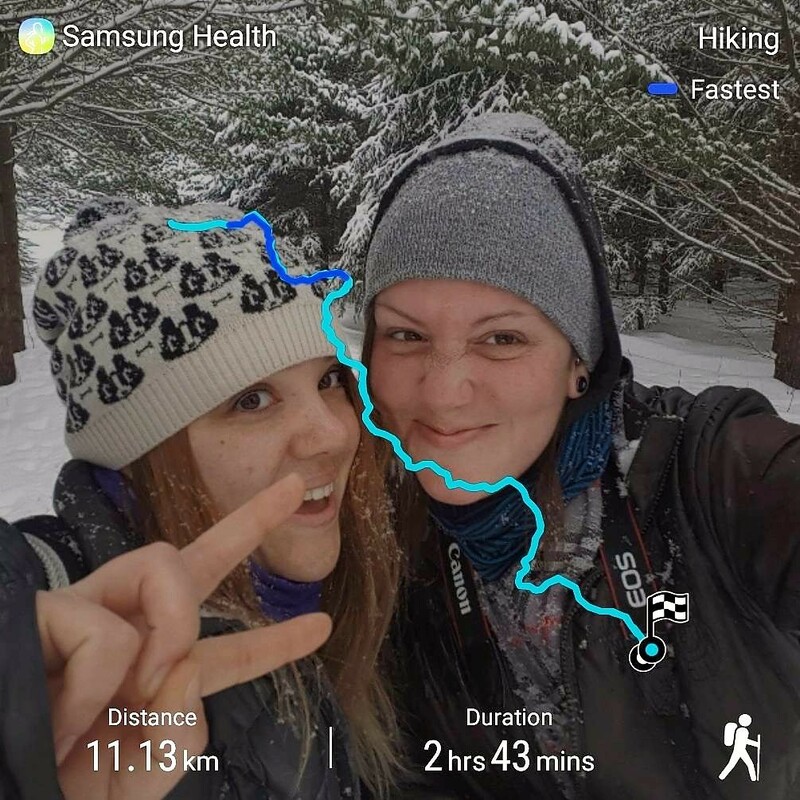 They have their own small trail network, and an extensive collection of First Nations and Inuit artist pieces, as well as the Group of Seven. 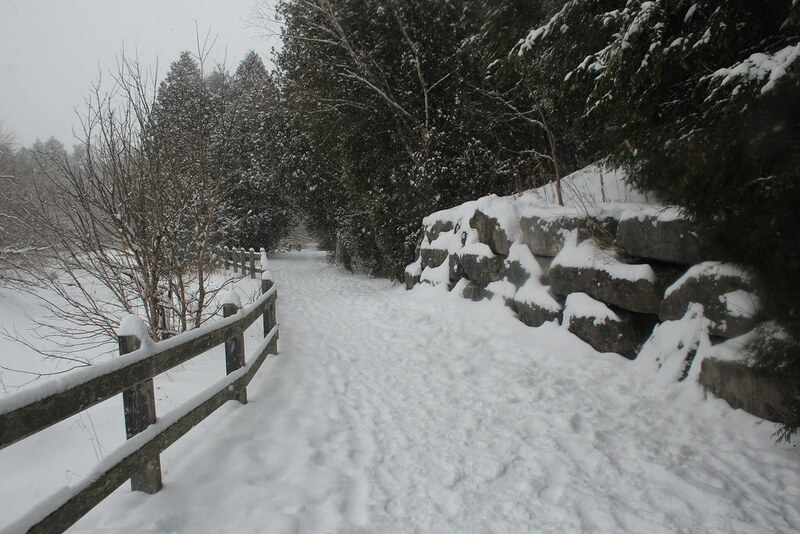 The William Granger Greenway follows the lower trail, which continues to closely follow the Humber River. Through the trees, you can spy the museum on the hillside above. There are active beavers in the area, and though we only saw partly chewed-through trees, I wouldn’t be surprised if fallen trees were rather usual. From here, it’s less than 500m to the end of the line in Bindertwine Park, where we turned around and headed back. Somebody forgot to let the robins know that the groundhog predicted six more weeks of winter. There were quite a few of these guys adorning the trees, all puffed up to ward off the cold. 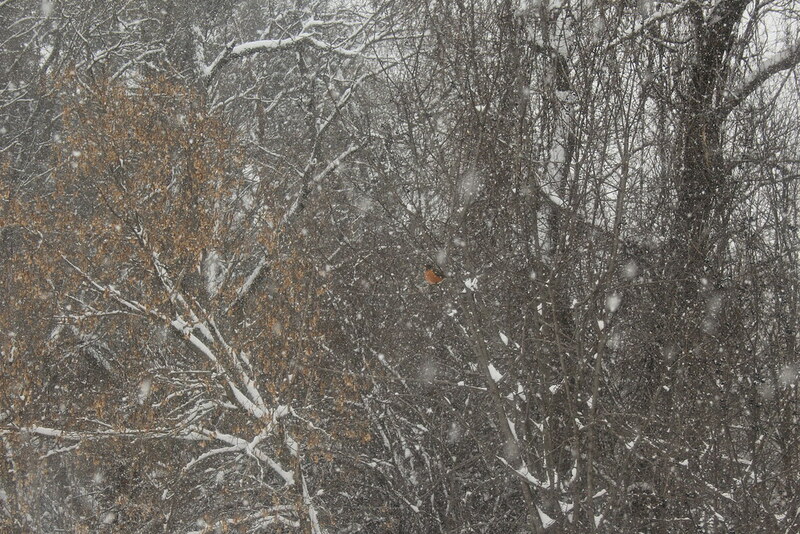 I was always told robins were a sure sign of spring. Maybe the groundhogs were wrong?? 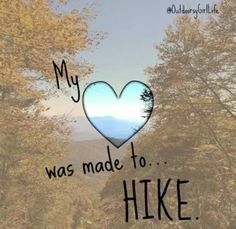 Have you had any interesting encounters with other trail users?